We admit it - this Roasted Tomato & Basil Pesto Benedict is likely to ruin things for any other breakfast that comes after. 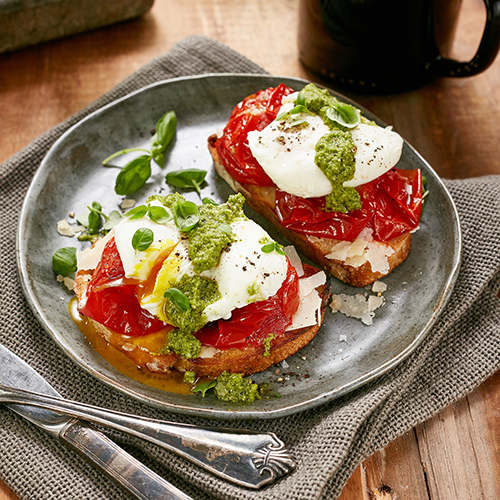 One bite will prove that this is pesto’s true calling – a tempting treat deserving of its place upon an egg, laid on top of fresh cherry tomatoes, resting upon a bed of shaved Parmesan and a slice of our superb Potato Rosemary Loaf. Sprinkled with basil and served warm it’s a sure bet this little miracle is going to be making an encore appearance. It’s just as tasty for lunch, dinner, or snack time. Indulge. Pre-heat oven to 450°F (232°C). Line a baking tray with parchment paper. Place tomatoes on lined baking tray, drizzle with olive oil and roast for 15 minutes. Toast bread slices and spread with butter. Top each with shaved parmesan and 2 tomatoes. In a small saucepot, bring water and vinegar to a gentle boil. Working in batches, poach each egg, cooking for 3-4 minutes. Top each bread slice with a cooked egg. Spoon pesto over eggs, season with salt and pepper and garnish with micro basil. Serve warm and enjoy!